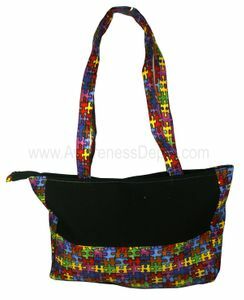 Autism Awareness handmade purse style 211 features a black main body with a 5 inch wide strip of puzzle fabric that goes all the way around the main body of the purse. All visible stitching is rainbow colored and the lining is a durable cotton. Closes securely with a zipper. Inner and outer layers and straps are reinforced for durability but are not stiff. 3 inch wide strip of puzzle fabric goes along the sizes and bottom of the purse. We would consider this a 'large' sized purse. 10 inches by 15 inches wide by 3 inches across the bottom. Two 1 inch wide black straps with 12 inch drop. Two inside pockets and a zipper closure.